Eagle hand sink model #HSA-10-FE-B-T-NB-MG with MICROGARD antimicrobial protection. Kimberly-Clark hard roll towel dispenser with quiet touchless technology. Eagle part #384796. Use Kleenex #25639, Scott #25703 or Scott #43960 towel roll. Chicago HyTronic splash-mount gooseneck faucet, with dual-beam infrared sensor. Self Sustaining Power System creates the power needed, even with low flow outlets. Eagle part #384969. Purell/LTX hand sanitizing dispenser. Eagle part #377455. Gojo/LTX hand soap dispenser. Eagle part #377456. FoodHandler glove rack for single service gloves. Model #11-0012. Eagle part #352855. Tucel soft bristle white nail brush. Model #1832. Eagle part #348602. 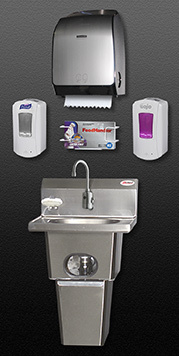 HFL-5000 Touch free handwashing system includes handsink with Microgard antimicrobial protection, stainless steel trash receptacle, towel dispenser, Chicago electronic eye faucet, Hand sanitizing dispenser, hand soap dispenser, nail brush and glove rack for single service gloves.